Part of the "Coloring Books for the Soul" series, a dazzlingly beautiful adult coloring book, filled with magical, mystical imagery that celebrates the major and minor arcana of the tarot—a creative and inspiring invitation to nourish our souls and reconnect with our spirit. 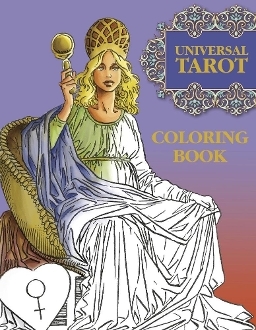 The Enchanted Tarot coloring book features the award-winning illustrations from Amy Zerner and Monte Farber's bestselling, classic tarot deck. Drawn in Amy's iconic tapestry collage art style, each illustration is a work of art that takes reads on a soothing, meditative journey to a world of myth and majesty, beauty and illumination. The forty line drawings are accompanied by text that guides colorists through each suit of the deck, introducing all the key players of the major and minor arcana, from The Fool to The Magician to The Empress. Gorgeously packaged with a vibrant four-color cover by the artist and filled with fresh, modern illustrations suitable for framing, The Enchanted Tarot is an ideal way to unwind and create beauty in our lives.